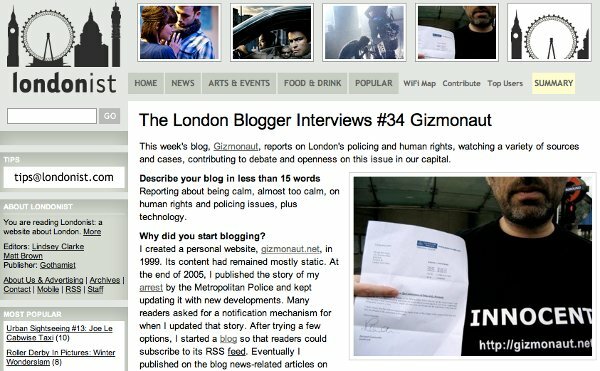 Jaz Cummins interviewed me a few weeks ago for the Londonist for her series of London Blogger Interviews. This interview, #34 in the series, has just been published. It was an interesting exercise as I hadn't previously spent much time reflecting on the blog itself. The 15 words or less description I came up with is: 'Reporting about being calm, almost too calm, on human rights and policing issues, plus technology.' Thanks to Jaz and M@ for organising it and to Jaz for the questions. Read the full interview at the Londonist. You can comment at the Londonist or by email (see 'feedback' link at the bottom of every post). I had offered my home to U, a middle-aged Algerian about whom I knew little except that he had been imprisoned without charge or trial for over six years and who his solicitor described as “very studious.” He would effectively be under house arrest on a 24-hour curfew, tagged and monitored with surveillance equipment, his only relief from confinement being access to the back garden. Parts of the interior of the house were forbidden territory, e.g. the computer room, where my computer had new passwords installed and was put in a specially designed steel safe behind a reinforced door and extra window locks. The hearing started at 11.30 with Mr Robin Tam QC for the Home Office. Mr Tam favoured outcome was the revocation of U's bail or alternatively the imposition of strict bail conditions comparable to those in place before February 2009. However, if the bail was not revoked, he wanted U to go to another location than Brighton; no reason was given for this request. A key argument of Mr Tam was that U is a risk to national security and, as his deportation case is progressing and getting closer to a conclusion, the attendant risk of absconding is increasing, hence a precautionary approach must be adopted. Mr Tam insisted that the bail application is ancillary to the matter of the deportation, the core issue in the main proceedings. Mr Justice Mitting pointed out that such a precautionary approach for SIAC could suggest denying bail to all appellants, with the decision effectively becoming that of the Home Secretary. Mr Tam made a more flippant comment later on: it's not because the Secretary of State has the power to detain that he will detain everyone! Mr Justice Mitting asked Mr Tam how does he see the Strasbourg approach to scrutiny of national security assessments apply, to which Mr Tam answered, if SIAC does not have the tool to make the fine assessment required of national security, it has to apply a lighter touch. Some of the verbal exchanges gave me the impression that the Home Office would be happy for the scope of SIAC to be reduced. It was mentioned that the security services have revealed, for the first time in open evidence, weaknesses in electronic tags. As the problems are apparently so severe this technology can't be trusted, if bail is granted then conditions will need to include 24 hours house arrest. We had to temporarily vacate the room later in the morning as Mr Justice Mitting asked for a brief closed session. The open session session then continued until 1pm and reconvened at 2pm. Ms Stephanie Harrison, the barrister representing U, countered the Home Office by arguing that fair hearings overrides national security concerns. Bail assumes that the detention is lawful and that the decision is about whether U can be released with conditions. I.e., the decision must be about whether objections from the Home Office were valid, if so whether they can't be met. Ms Harrison pointed out that when he was on bail, U met all the imposed conditions (and Mr Tam confirmed that 'we have made no complaint to the contrary') and that she was confident that these bail conditions could be restored. Ms Harrison also commented that the deportation case has still likely at least 18 months to go in domestic courts and would then likely be appealed to Strasbourg, suggesting that such a length in time would mitigate the alleged increased risk of absconding. A large part of the interventions consisted in technical legal points about bail legislation, tests for bail granting and revocation (a possible test for new cases could be whether detention is for the purpose of deportation, and whether it is arbitrary? If the answers are respectively yes and no, then bail should be approved with a strict time limit), calibrated approach (relying on the use of secret evidence) vs. the Strasbourg approach (as expressed by the European Court of Human Rights), etc. Mr Justice Mitting commented that in SIAC (which 'deals with appeals against decisions made by the Home Office to deport, or exclude, someone from the UK on national security grounds, or for other public interest reasons') the statutory presumption is to detain. He recapped some of the issues the judges will have to consider when making their decision: now that we don't have access to closed material, can the risk of absconding be adequately managed. Is it likely that he'll break his bail conditions. We're looking at this solely in the light of the open material. Before the three judges retired at about 5pm, two special advocates also intervened. The two other judges, sitting on each side of Mr Justice Mitting, have never seen the secret evidence. They remained silent during the proceedings. About five minutes later, the three judges came back and Mr Justice Mitting announced their decision to uphold the revocation of bail on the basis of the open evidence. Reasons for this decision will be provided in the ruling to be published after Xmas (it has to be vetted by the security service, before publication). The current lack of explanation is not just frustrating for all those present, but is also delaying the judicial review of this decision that Ms Harrison will request. Next Monday, on 2009-12-14, SIAC will hear the bail revocation applications for XC and UF, two of the Pakistani students arrested in April as part of Operation Pathway, a round-up of twelve men in connection with a purported 'major terrorist plot' and currently detained in prison. If you can make the time it is worth attending. At times SIAC can feel like a charade. Some of the Home Office arguments appear entirely circular: e.g., there's a high risk to national security as SIAC cases are serious and of high severity, hence SIAC must manage 'the magnitude of the seriousness of the risk should it eventuate'. It is important to realise the damage that the use of secret evidence has done to fair trials and how it stills obstructs the judicial process. (Sign the petition, lobby your MP.) Attending a SIAC hearing demonstrates the damage done to fair justice by the successive Home Secretaries invoking opaque concepts such as 'national security' and resorting to secret evidence. Update: for more background and another take on this SIAC ruling see Andy Worthington's Calling Time On The Use Of Secret Evidence In The UK. First published on 2009-12-07; last updated on 2009-12-10. 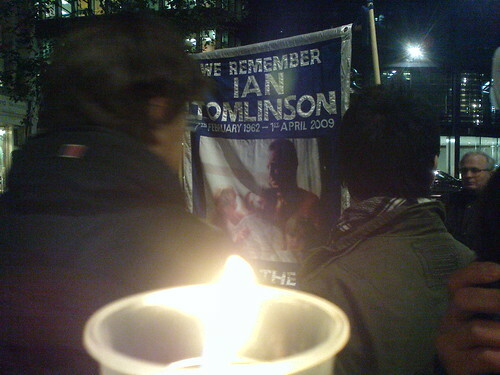 Ian Tomlinson was remembered earlier today with a candlelight vigil. Eight months earlier, he died on his way home after being hit by police officers during the G20 demonstration. The Independent Police Complaint Commission (IPCC) completed its main investigation and passed a file to the Crown Prosecution Service. The IPCC have also been asked by the family of Ian Tomlinson 'for a full report on what looks like a cover-up'. The CPS is considering whether to press charges.